We offer quality video tape to digital transfer using pro-class in-house professional equipment from Sony, JVC and Black Magic Design. We've got fully-serviced tape input devices for most analogue tape formats and as a result, we can convert your VHS, S-VHS, DV, DVCAM, Hi-8 and Digital8 video tapes to DVD or digital MOV/MPG/H.264 files at very attractive rates. Sadly all videotapes deteriorate over time. In fact about ten to fifteen years is the limit, often less. Equally sadly, once the surface of the tape starts to decay through damp or close proximity to magnetic fields, it's often difficult and sometimes impossible to recover the footage. The best solution is to convert them to digital NOW. Our equipment is multi-standard and we convert NTSC tapes to PAL too. Our conversion process allows us to correct timebase errors plus tint, brightness, contrast and sound quality. We don't subcontract or send your tapes elsewhere, so you can be assured of quality and privacy. All video conversions are carried out in-house by ourselves. As you'll probably know there a number of video compression formats. Generally, the higher the quality of the video, the less video time per DVD. If you simply want your DVD to play on a standard player, then leave it to us. If you want to take your converted footage and edit it on your PC or Mac, please be sure tell us. 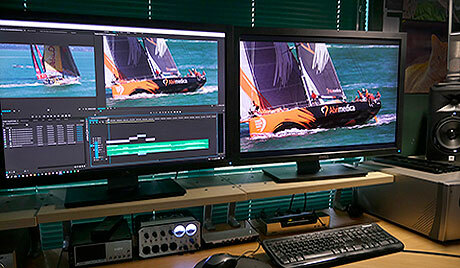 We can provide digital video in all file formats and codecs supported by Adobe Premiere and Media Encoder CC. How much video on one DVD? The length of video that will fit on one DVD depends on the video compression used. We do our utmost to retain quality, so the short answer is from 1 to 2 hours per DVD. We'll advise you in more detail when you bring in your tapes. Yes, we can do this for you but a word of warning. Today, we invariably watch TV in full HD or even 4K and we are used to this picture quality. The trouble is, most old videos were shot in good old PAL SD and don't upscale well, even when using top class equipment. Please allow us to advise you when asking for this option. We are sorry, but we cannot copy or convert copyrighted material such as films and TV programs unless it is for your own private use. If you shot it on your camera, it belongs to you. If you copied it from other sources, we both need to be sure that the footage is yours to copy. Please be sure! We've now converted hundreds of hours of video for customers. Does it all get watched? Sadly, probably not. Today's commercials tell a story in seconds. Documentaries cover a subject in 30 minutes. There's a good rule in video. If it doesn't add to the story, cut it. That's fine if you have the expertise to edit your videos into a show that people want to watch. If not, sit with us and we'll help you. Our charges are cost-effective and we'll help you put together a story that's cogent and compelling. With your creativity and our technical expertise, we'll make your videos come alive. 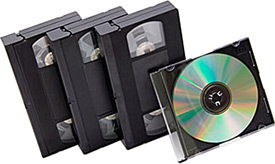 Pricing - Video Tape Transfer to DVD or file For any VHS, S-VHS, VHS-C, DV, DVCAM, Hi-8 or Digital-8 tape to DVD or digital file. Choose either MPEG-2, 720 x 576 pixels, 6.8 MB/s transfer rate, or DV/MOV 720 x 576 pixels, 28.8 Mb/s transfer rate. Prices per tape ex-GST. Yes, we offer in-house regular and super-8 movie film transfer using our MovieStuff Retro-8 Pro frame-by-frame movie flilm scanner. For more information, please visit our Film Transfer Services page. Simply use our online Cost estimate and Order Form. Alternatively, give us a call on 0800 474748 for assistance.